Two years after rock-song-worthy heartbreak, Virginia Miller is looking forward to a fun, carefree summer. Her friends just landed a spot on a battling bands reality show, and Vee is joining them for her dream internship on tour. Three months with future rockstars seems like an epic summer plan. Until she learns she'll also be sharing the bus with Cam. Her first love, and her first heartbreak. Now Vee has more than just cameras to dodge, and Cam's determination to win her forgiveness is causing TMZ-worthy problems for both of them. With cameras rolling, she'll have to decide if her favorite breakup anthem deserves a new ending. And if she's brave enough to expose her own secrets to keep Cam's under wraps. Breaking Vee's heart was never Cam's plan. All he wanted senior year was a new life, in a new town, uninterrupted by the tragedy he left behind. Then Vee swept him into a whirlwind of friendship, musical adventure, and a love he didn't expect or want. Now, he has a second chance to make it right. But things get complicated when ratings-crazy producers, cameramen, and fans are involved. Can he rewrite their love song with the whole world watching? Sometimes the last note is just the beginning. 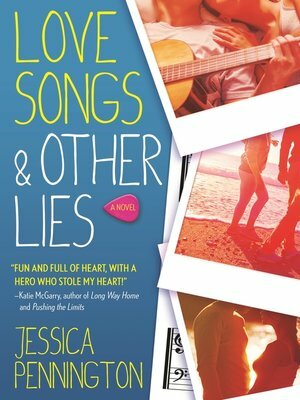 Love Songs & Other Lies is the debut romance from Jessica Pennington that Katie McGarry calls "fun and full of heart with a hero who stole my heart!"